Evangelical Textual Criticism: How long will it take to completely revise the Nestle edition? How long will it take to completely revise the Nestle edition? So we need more places like Münster, Birmingham (UK), and Wuppertal. Perhaps it's time that a US institute joined the labor force. *From Klaus Wachtel, “Editing the Greek New Testament on the Threshold of the Twenty-First Century,” Literary and Linguistic Computing 15, no. 1 (2000): 43–50 (48 n. 2). I assume, possibly erroneously, that the pace of editing is slow do to collating of manuscripts? If so, wouldn't the increase of high resolution images of manuscripts since 2000 make this process quicker, possibly much quicker? Tim, I don't think so actually. At this point they had already been semi-automating the collation process for several years. Although yes, I think the incubation for James was probably longer than for some of the other fascicles. The IGNTP has been a transatlantic co-operation for all of its existence, and digital communications and ways of working now make this even easier. So although the executive editor is based in Birmingham, a substantial proportion of the committee comes from the USA and there is ongoing work which will contribute to the ECM. Given the date of this reference, this calculation was made well before the Birmingham (let alone Wuppertal) cooperation, wasn't it? If so, then perhaps more optimistic figures are in order! That raises a good question. If Acts and John were published in the next twelve months, then I figure that Nestle would be finished in about 50 years. 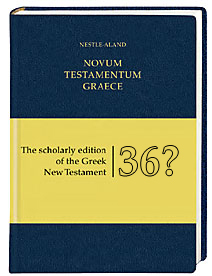 Together with the Greek New Testament, the Novum Testamentum Graece has attained an undisputed position of preeminence among New Testament scholars over the past few decades. With the exception of some details, the principal text of these editions has no longer been modified for around thirty years. However, this does not mean that New Testament textual research has reached its conclusion or could do so in future. Quite the opposite is the case. The Institute for New Testament Textual Research in Münster, for example, is currently working on an entirely new edition of the Greek-language New Testament, the so-called Editio Critica Maior, which will document the history of the Greek text through the first millennium on the basis of Greek manuscripts, old translations, and New Testament citations in ancient Christian literature that are of significance to the history of transmission. This edition therefore also provides information for answering further questions: How does a text change over the course of history, and why? How was a text received in the early Christian era? The original biblical text was also reconstructed once more in this connection with a newly developed method; in this process it became evident that the existing text required extensive modification. The first installment of this edition appeared in 1997. The “Catholic Epistles” (the Epistles of James, Peter, John, and Jude) are now in print. The Acts of the Apostles and – in cooperation with the renowned “International Greek New Testament Project” – the Gospel of John are currently under preparation. The entire Editio Critica Maior is to be completed by 2030. This project is being supported by the Union of the German Academies of Sciences and Humanities. Recently it seems, that some people (from the US) try to overlook (or lets say: ignore) the impressive work that has been done by the INTF in Münster over the last 56 (!) years ("Nestle-Aland" and the "UBS Greek New Testament", and also the work that is still in progress ("Editio Critica Maior").